The State of Hessen plans to build a new building for the “chemical institutes (1st construction phase)” at the Riedberg Campus, which is to be used as a teaching and research building as well as a “technical centre”. As part of the design process, it should be conceptually outlined exactly how the building can be expanded by one or more construction phases using a modular process (research building) in order to accommodate further areas of the department. In the 1st construction phase, the beginning of the urban development of the new chemical institutes building is to be set out. The solitary concise building already forms the spatial counterpart to the existing buildings of the “traditional chemistry” and the cafeteria, with the central campus square as the connecting centre. In further construction phases, the structure of the 1st construction phase will be expanded eastwards in a modular process. An ensemble of building zones and courtyards or open areas of varying depth will be created. The depth of the building parts as well as the dimensioning of the courtyards is flexible and conforms to the respective user needs. This makes it possible to precisely illustrate the exact space requirements of the further construction phases. A central square will be formed as a clear connecting element to the already existing buildings of the faculty for chemistry as well as to the cafeteria and the beginning of the new chemical institute. This opens up in various directions, thereby creating flowing transitions and open spaces and leads the pathways to the neighbouring areas. The differentiated 4-storey building picks up on the scale of the already existing building for physics and geoscience as well as biology and also functions as an identity-forming sign for the faculty for chemistry offering a high level of recognition. A central vein runs through the ensemble of buildings functioning as a main development zone and horizontal connection. The main stairs, the goods lift and the different design variations of the courtyard are directly attached to the building ensure optimum lighting of the deeper building zones as well as good orientation. 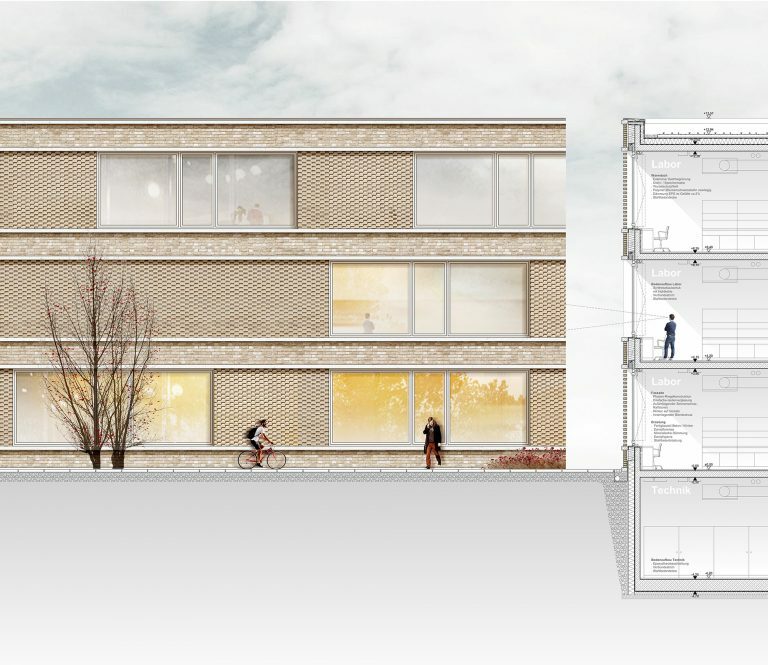 The design of the facade is orientated around the brick facades of the neighbouring buildings. Accordingly, a brick structure has been laid around the entire building as a curtain-like facade element creating an interplay of closed and semi-transparent areas.